(Nanowerk News) Borrowing a trick from nature, engineers from the University of California at Berkeley have created an incredibly thin, chameleon-like material that can be made to change color -- on demand -- by simply applying a minute amount of force. 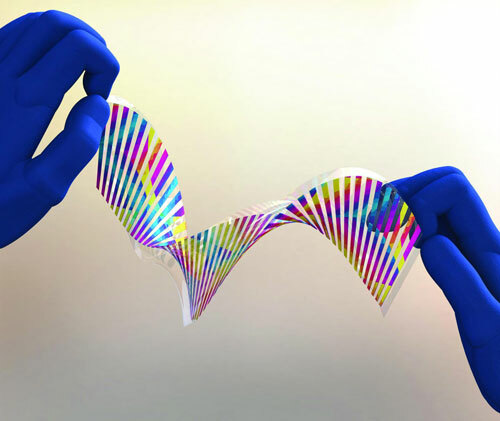 "This is the first time anybody has made a flexible chameleon-like skin that can change color simply by flexing it," said Connie J. Chang-Hasnain, a member of the Berkeley team and co-author on a paper published today in Optica ("Flexible photonic metastructures for tunable coloration"), The Optical Society's (OSA) new high-impact journal. By precisely etching tiny features -- smaller than a wavelength of light -- onto a silicon film one thousand times thinner than a human hair, the researchers were able to select the range of colors the material would reflect, depending on how it was flexed and bent. The colors we typically see in paints, fabrics, and other natural substances occur when white, broad spectrum light strikes their surfaces. The unique chemical composition of each surface then absorbs various bands, or wavelengths of light. Those that aren't absorbed are reflected back, with shorter wavelengths giving objects a blue hue and longer wavelengths appearing redder and the entire rainbow of possible combinations in between. Changing the color of a surface, such as the leaves on the trees in autumn, requires a change in chemical make-up. Recently, engineers and scientists have been exploring another approach, one that would create designer colors without the use of chemical dyes and pigments. Rather than controlling the chemical composition of a material, it's possible to control the surface features on the tiniest of scales so they interact and reflect particular wavelengths of light. This type of "structural color" is much less common in nature, but is used by some butterflies and beetles to create a particularly iridescent display of color. The authors of the Optica paper applied a similar principle, though with a radically different design, to achieve the color control they were looking for. In place of slits cut into a film they instead etched rows of ridges onto a single, thin layer of silicon. Rather than spreading the light into a complete rainbow, however, these ridges -- or bars -- reflect a very specific wavelength of light. By "tuning" the spaces between the bars, it's possible to select the specific color to be reflected. Unlike the slits in a diffraction grating, however, the silicon bars were extremely efficient and readily reflected the frequency of light they were tuned to. Since the spacing, or period, of the bars is the key to controlling the color they reflect, the researchers realized it would be possible to subtly shift the period -- and therefore the color -- by flexing or bending the material. "If you have a surface with very precise structures, spaced so they can interact with a specific wavelength of light, you can change its properties and how it interacts with light by changing its dimensions," said Chang-Hasnain. Their initial design, subjected to a change in period of a mere 25 nanometers, created brilliant colors that could be shifted from green to yellow, orange, and red - across a 39-nanometer range of wavelengths. Future designs, the researchers believe, could cover a wider range of colors and reflect light with even greater efficiency. "The next step is to make this larger-scale and there are facilities already that could do so," said Chang-Hasnain. "At that point, we hope to be able to find applications in entertainment, security, and monitoring." "This is the first time anyone has achieved such a broad range of color on a one-layer, thin and flexible surface," concluded Change-Hasnain. "I think it's extremely cool."